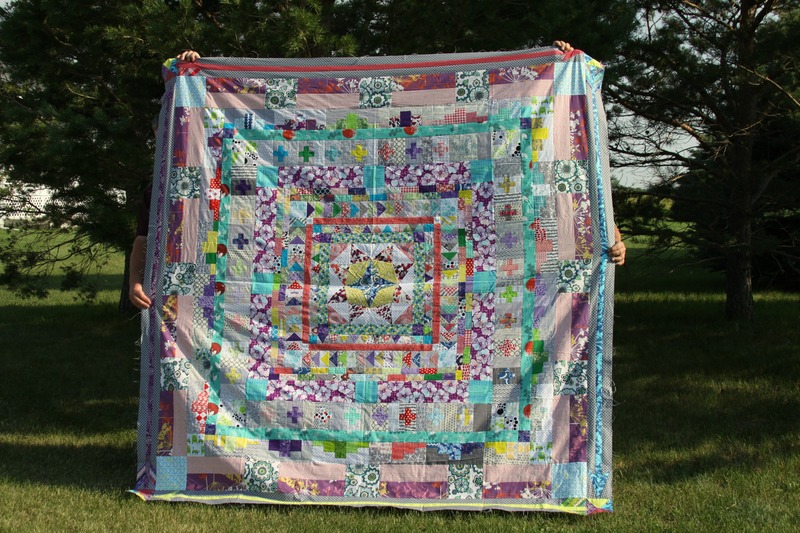 Marcelle Medallion Quilt Top Finished! I can hardly believe it: my quilt top is finished! I added several extra borders to bring the quilt to full size. I almost always make queen size quilts, having had a queen size bed since I was about five years old, so this one was actually small for me. 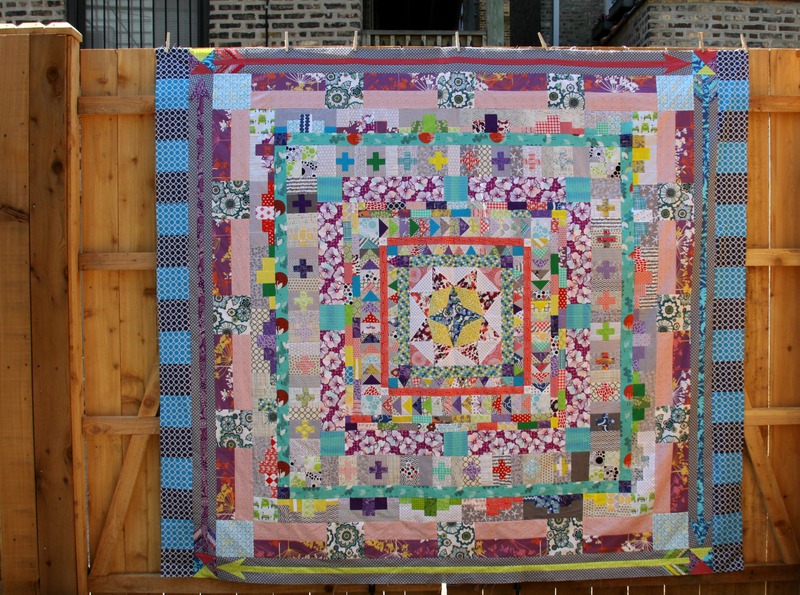 My first “bonus border” (moving outward, it’s after the plus signs and the border that surrounds them) was inspired by this border on Lynn Droege’s Tangerine Rose quilt, exhibited at the Quilt Show in Madison, Wisconsin, in September 2012. Pieces above are for one “set.” Each side of the quilt requires 5 full sets and 1 partial set. A partial set excludes either the left or right column. The finished border width is 4.5″ with cornerstones (cut at 5″). I intended to have a solid second bonus border, but my half yard cuts were insufficient for the width I wanted. I added print squares as a filler. You might notice I also did this for one of the original borders when I accidentally measured wrong and made the strips too short. 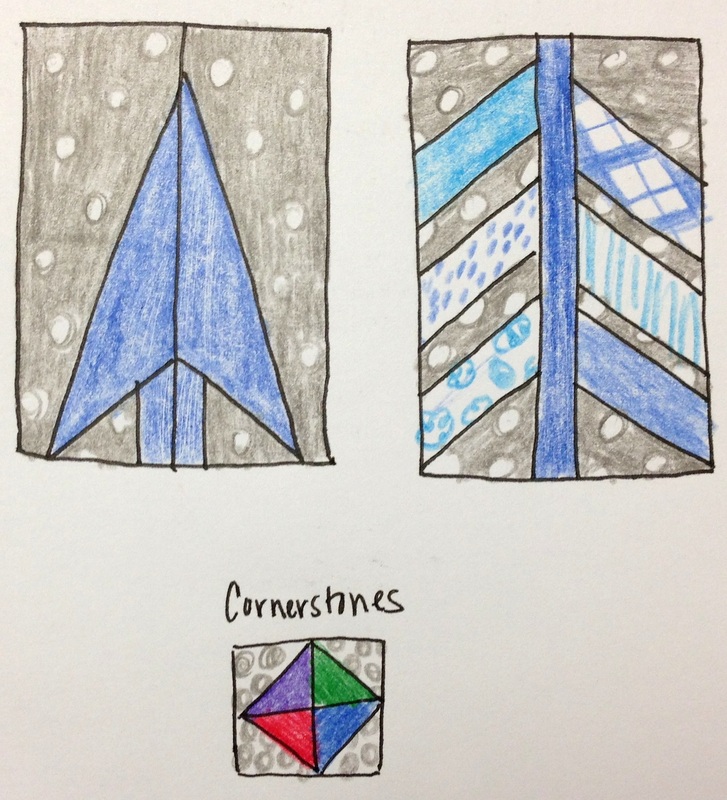 My final border (only on the sides) is another simple one: alternating blue blocks. 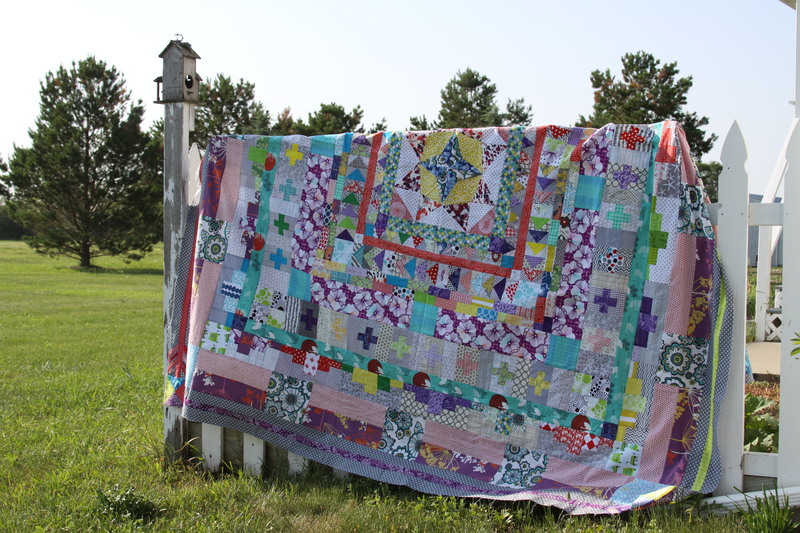 I got to photograph the quilt–all but the final bonus border–over the long Fourth of July weekend with the help of my two favorite men (my dad and boyfriend) in my favorite place (South Dakota). The next question is how to quilt the darn thing. I have seen at least two people do concentric circles or spirals. 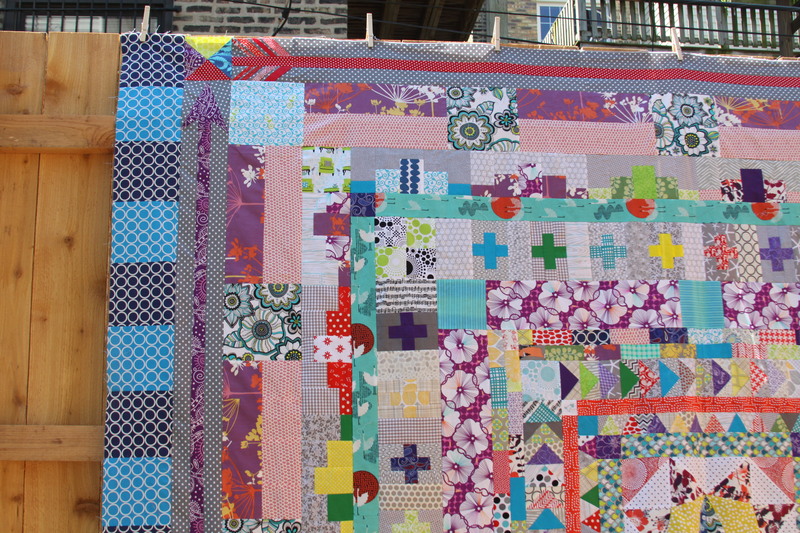 A handful of people have quilted straight lines across the solid borders. 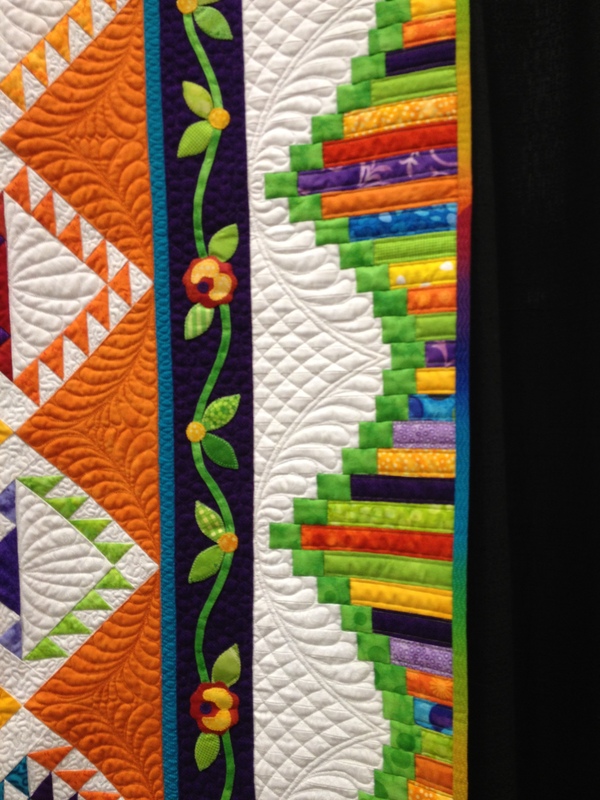 One person had an amazing longarm quilter consider each border individually. Hopefully I can come up with something worthy of the quilt top soon; it would be a shame to leave this bad boy sitting on a shelf somewhere! Categories: Quilts | Tags: a beautiful mess, abeautifulmess, alexia abegg, amh, amh feathers, anna maria horner, anna maria horner feathers, arrow paper piecing, arrows, feather bed quilt, foundation paper piecing, marcelle medallion, medalionalong, medallion quilt, paper piecing pattern, paper piecing template, quilt, quilt borders, quilting | Permalink.